I had the great pleasure of visiting Portland International Airport this week to help Travel Portland welcome the tallest freestanding cuckoo clock in the country to the spot where it will entertainingly tell time till the end of March 2015. 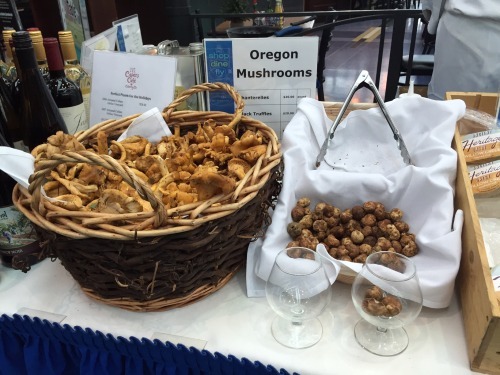 I also had a chance to see, smell and taste some of the Oregon-sourced delicacies offered up at the farmer’s market that pops up twice a week at the airport. The market is the brainchild of Christian and Annette Joly, who own Caper’s Cafe at the airport, and they were on hand during my visit offering tastes of cheese and freshly sauteed mushrooms as well as intoxicating whiffs of Oregon truffles, from a table also laden with fresh Oregon produce and other tasty treats. @hbaskas @flypdx Awesome to see innovative airports promoting REAL local businesses and products. A giant chainsaw-carved cuckoo clock is helping to keep Portland, Oregon – and its airport – weird. A project of Travel Portland and created for a winter tourism campaign, this cuckoo clock is 24-feet-tall, nine-and-a-half-feet wide and weighs in at 7000 pounds, making it the largest freestanding cuckoo clock in the United States. The impossible to ignore clock has taken up residence in the south atrium of Portland International Airport and is scheduled to be there through March, 2015. The clock is fully functioning and is adorned with chainsaw carvings representing more than a dozen Portland icons and activities, including Sasquatch, Portlandia, Mt. Hood, beer and wine, roses and timber. The main carvings on the clock were all made from a single tree, an Oregon maple, and were all carved by chainsaw artist Chester Armstrong. And every hour on the hour a cuckoo (in this case, a chicken) and several other carved figures parade between two little doors that open at the top of the clock.